This is such a quirky unusual plant that it will certainly catch people's attention. 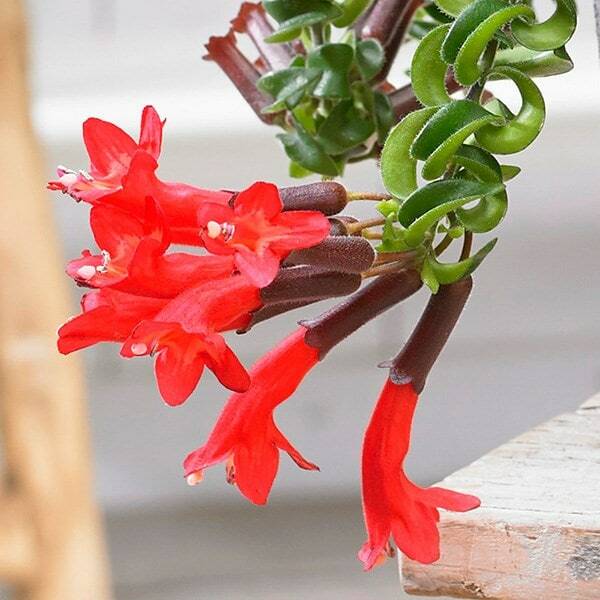 Known as the lipstick plant because of the tubular scarlet flowers which sprout out from the ends of the bright green, fleshy twisted leaves. 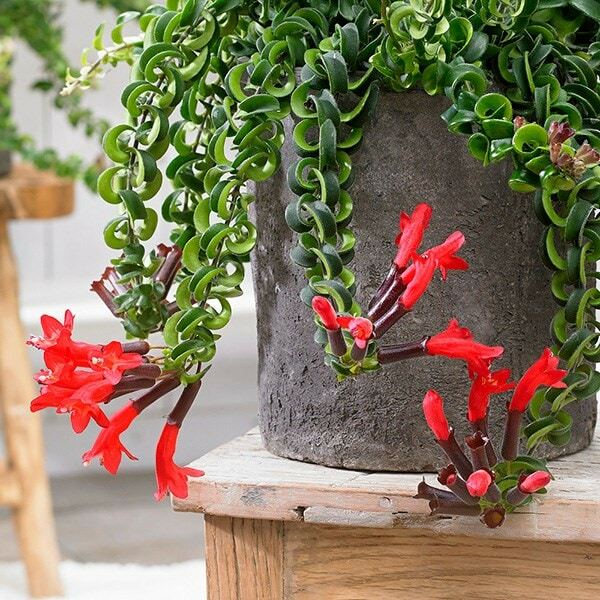 Perfect for growing indoors in a hanging basket where the curling foliage and tropical looking flowers can tumble over the edge to be fully appreciated. Originating from rainforests these plants like a humid warm atmosphere in a brightly lit spot, but not in direct sun, so a steamy bathroom or kitchen would be ideal. Please note that the pot in the photograph is not supplied with the plant (which is sent out in a hanging plastic pot). They do however make excellent potted plants, and if you wish to pot yours up, we do have a wide range of pots on our website to choose from. Home care: Although not difficult to grow they do have certain requirements. They are used to the humidity of tropical rainforests so mist the leaves regularly and keep them warm. Don't let the temperature fall below 55°F or 13° C and keep away from draughts. Water regularly with tepid kettle or rain water from spring to autum, reducing in the winter to allow the plant a rest with slightly cooler temperatures. Feed regularly through the growing season with a balanced houseplant fertilier.